VICTORIA FALLS, Zimbabwe (PAMACC News) - The African Development Bank (AfDB) has called for a more climate resilient investments in Africa because the current global climate financing architecture is not providing the finance needed by the continent. “Africa is shortchanged by climate change,” said Bank representative, Mary Manneko Monyau. “Africa is shortchanged by the lack of sufficient climate financing. 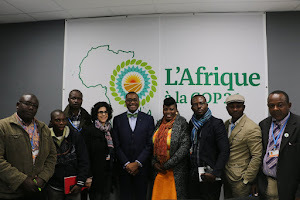 Much more needs to be done to increase Africa’s access to climate finance”. She was addressing the fifth conference on Climate Change and Development in Africa (CCDA-V), an annual event convened by the ClimDev-Africa program to deliberate on climate change and economic development in the continent. Ms. Monyau has noted that “Climate change is no longer a domain for scientists and climate experts” due to the evidence of impacts on economic development and livelihoods, especially agriculture and ecosystems. The Bank is therefore committed to enhancing Africa’s access to multilateral climate funds, but also to facilitate the mobilization of domestic resources from private and public sources. Mr. Seth Osafo, Ghanaian climate change expert and member of the African Group of Negotiators, has emphasized the need for countries on the continent to commit local resources to implement climate activities. He cites the experience of vulnerable Bangladesh which managed to mobilize $200million from its local resource to address adaptation and other impacts of climate change – the country later leveraged an additional $400million from the international community. “If we are to move on as Africa and be able to address it aside from incorporating climate change issues into our development plans, we need also to put resources – our own resources – into addressing the problem before we can also leverage additional funds from other countries,” said Mr. Osafo. The African Development Bank has spent nearly US$7 billion towards climate finance in Africa between 2011 and 2014 – Energy and Agriculture are the Bank’s two major areas of focus. President of the Bank, Dr. Akinwumi Adesina, recently announced that the Bank will step up climate financing by 40 percent to US$ 5 billion per year by 2020. These investments will be delivered within the framework of five priority areas that build on the Banks Strategy for 2013-2022 – including Feeding Africa, Lighting up Africa, Integrating Africa, Improving the Livelihoods in Africa and engaging more with the Private Sector. The Bank has worked closely with the African Group of Negotiators, and fully supports the African Common Position under the United Nations Framework Convention on Climate Change. Key elements of Paris agreement include global commitments that are ambitious enough to keep temperatures below 2 degrees centigrade and availing finance and mechanisms to enable Africa adapt to the impacts of climate change. The Bank has also significantly stepped up its support for African countries to build resilience to the impacts of climate change, but also to seize the opportunity to drive low-carbon, climate-resilient growth.